Maha Shivaratri is the time of year when we come together to honour the greatest bhakta of them all, Lord Shiva. From the sounds of the Damaru drum, to the shouting of "Hara Hara Mahadev", the night was filled with devotion towards the Ultimate Destroyer, Shankar. As mentioned in previous posts, Lord Shiva is a symbol for the destruction of our ego and pride, but it's not only this destruction that we commemorate. On Maha Shivaratri, we offer our gratitude to Lord Shiva for the great blessings and sacrifices that He has given and undergone for the sake of humanity. One such case was when Shiva saved the devas and asuras during the Churning of the Milky Ocean from the deadly poison, "Halahala." It is for Lord Shiva's sacrifice of Love, among many other reasons, that we celebrate Maha Shivaratri. The morning prayers began at the early hour of 5:00 a.m. By worshiping the Guru first, the devotional Guru puja set the tone for the offerings to come. Upon Sri Swami Vishwananda's arrival, the Kalash puja had already begun and it wasn't long until Swamiji began to pour water over the Mrityum Bageshwar lingam and his personal deity, Giridhariji. 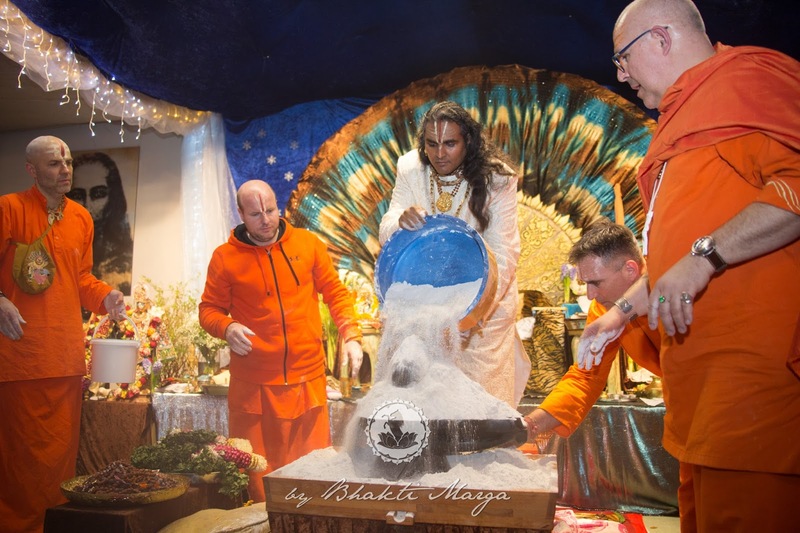 Simultaneously, there was a yagna conducted by the Bhakti Marga Swami's taking place. After the yagna had concluded and Guruji had finished his first part of the abishkeham, everyone was able to offer both water and a bilva leaf to the lingam and Giridhari. The morning ended with the singing of the Lingashtakam and prayers to Lord Shiva, ensuring that the night to come would be a success. The evening celebrations kicked off with a powerful start. 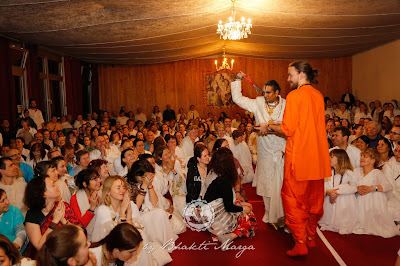 The Shiva bhajans were rocking and the devotees stood up to dance. With the singing of "Bam Bam Bhole! Bam Bam Bhole!" 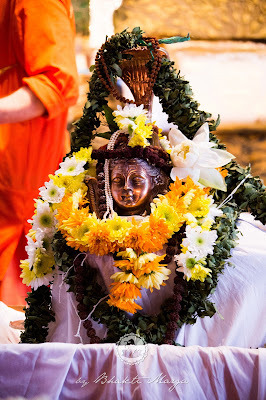 amidst the chanting of "Swaha" during the yagna, the energy quickly elevated. 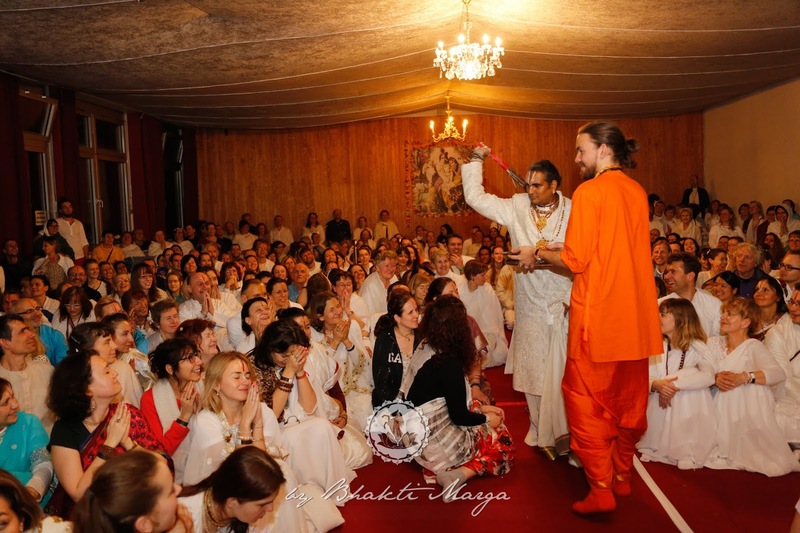 The prayers only intensified when Sri Swami Vishwananda arrived. 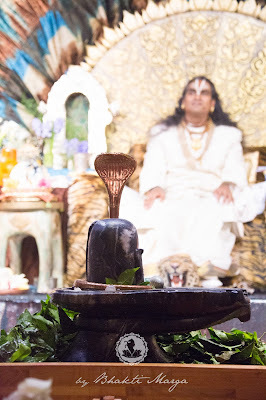 Throughout the entire night, Swamiji would make offerings to the Shiva Lingam and sing bhajans dedicated to Mahadev. In between all of this, each person was able to continue to make the auspicious offerings to the Mrityum Bageshwar lingam. The last puja was the grandest of all. 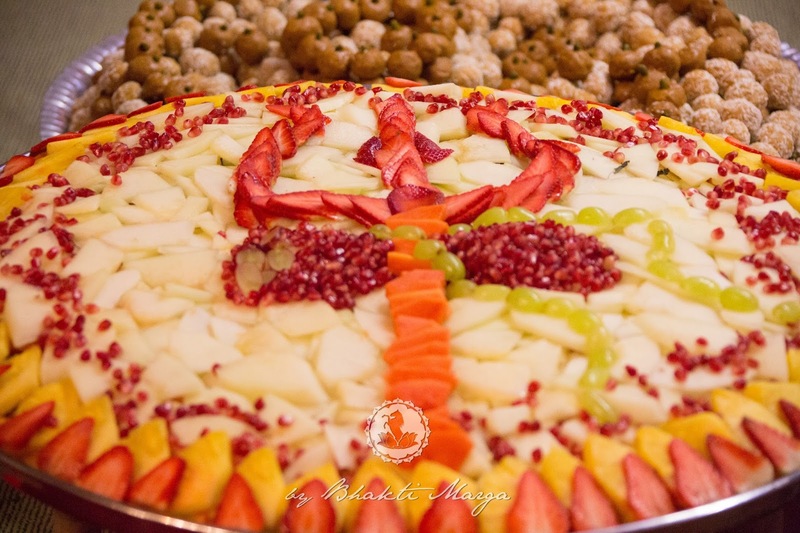 As Lord Shiva is easily pleased with the smallest of offerings, one can only imagine how pleased Mahadev could have been with the plentiful plates of prasad. The kitchen team truly did a remarkable job. 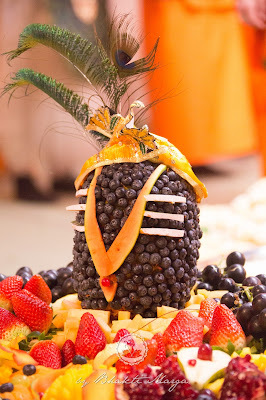 The prasad itself was constructed as Shiva Lingams and a design of Shiva's trishul. And when the ceremony was over, the taste matched the presentation, and though the Lord truly only cares about the Love which is offered, Mahadev was probably also pleased with the service of the culinary skill. You see, the blessing that you received, you know, like I said, the upliftment that you received today, other days you don’t receive that. That’s why this day is considered very auspicious. Yesterday [at the Shiva lecture] you heard them talking about Lord Shiva. So, you know who Bhagavan Shankar is and you know how important it is to have His blessing, and to have Ma Bhagavati Jagadambe’s blessing also, because they open the door for Giridhari to reveal Himself. Giridhariji is very shy. (Well, before He reveals Himself He is shy; after He reveals Himself He is not that shy anymore.) But until you reach that point of knocking at His door, you need Lord Shiva’s blessing. That’s why you see after the Mahabharat war that Bhagavan Krishna Himself said to the Pandavas, “Take refuge to the Feet of Lord Shankar. Go and do penance and when He comes, when He appears to you, then you know that all that you have done has been forgiven.” Here Bhagavan Krishna Himself said it, you know.